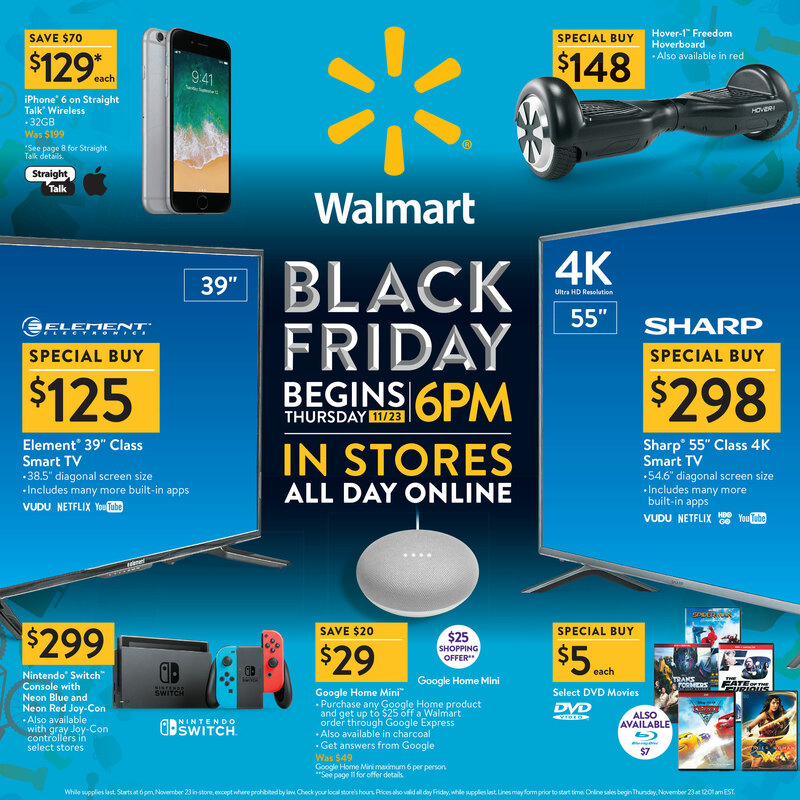 Walmart on Thursday published its Black Friday ad and as you’d expect, there are several attractive deals on a variety of electronics including televisions, game consoles, smart home gadgets, computers and more. If you’re in the market for a new television, Walmart has a 39-inch Element 720p set for $125, a Sharp 55-inch 4K model for $298, a Vizio 43-inch 1080p unit for $198 and a 65-inch Samsung 4K model for $998, among others. Gamers may be interested in picking up a PlayStation 4 with a 1TB hard drive for $199, a PlayStation 4 GranTurismo Sport VR bundle for $299 or an Xbox One S with a 500GB drive for $189. PS4 and Xbox One controllers will be marked down to $39. There’s also a huge collection of games on offer including hits like Need for Speed Payback, Forza 7, The Evil Within 2 and Overwatch for $29. Classics such as Left 4 Dead 2, Fallout 3 and Grand Theft Auto: San Andreas, meanwhile, can be had for just $9 each. In the mobile computing category, there’s a Samsung Chromebook 3 marked down to $119, an HP Touch Chromebook for $179 and a fifth generation iPad (32GB, Wi-Fi only) for $249. Walmart also has a 7” SmarTab tablet for $28 and an RCA Windows 2-in-1 tablet for $99 if you need an entry-level device. Customers will be able to access most of Walmart’s Black Friday deals via its website starting at 12:01 a.m. Eastern on Thanksgiving. In-store deals, meanwhile, will start at 6 p.m. local time later that day. In case you missed it, Best Buy published its Black Friday ad earlier this week and Amazon will be running deals through most of the month.